After many days of preparation, four days of USBCHA sheep dog trials (three days of "pro" dogs and one day of "novice" dogs), the Vassar Barn and trial run field are almost back to a normal, quiet state. However, for the four days of competition the site was bustling with activity. Over 40 dog handlers, an incredible breakfast/lunch 4-H crew and food booth, and probably over a hundred spectators made for a busy event here at the UC Hopland Research & Extension Center. 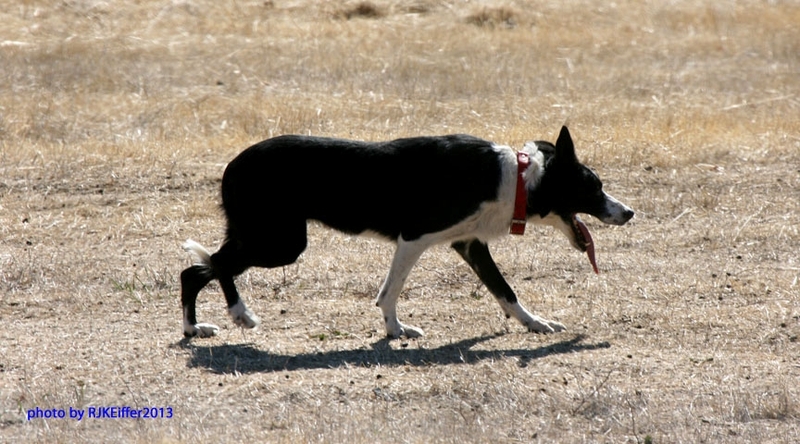 Here are a couple photos ... one of a typical border collie during a trial run (no ...the dog is not suffering or overly tired as the long, dangling tonque is typical of border collies in action and a way to cool their body down). The second photo shows a dog moving the group of four sheep towards the handler.